Success stories don't just happen. They are made. Join us on Feb. 5 at 5:00 PM in Scott Lab E0125 to learn more about Bosch! 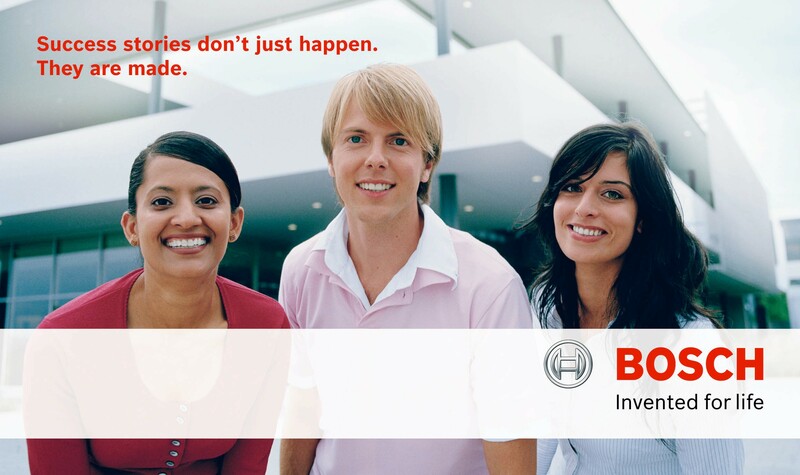 “Made by Bosch” stands for the first-class quality of a global player. Take advantage of the many attractive career opportunities available in an international company. The Bosch Research and Technology Center, with labs in Palo Alto, CA, Pittsburgh, PA, and Cambridge, MA focus on innovative research and development. We are looking for highly qualified, motivated, and innovative individuals to join our team. We invite you to participate in innovation for life! You can visit our table at the SWE Fair 2014! Free Food and Door prizes at our info session! Your profile: Master’s or PhD degree. Proven research track record required. Must display a strong degree of independence with excellent communication skills to work effectively in an interdisciplinary and international project team. See our website for full job descriptions. Make it happen. You can view all job descriptions online. Apply at www.boschresearch.com.